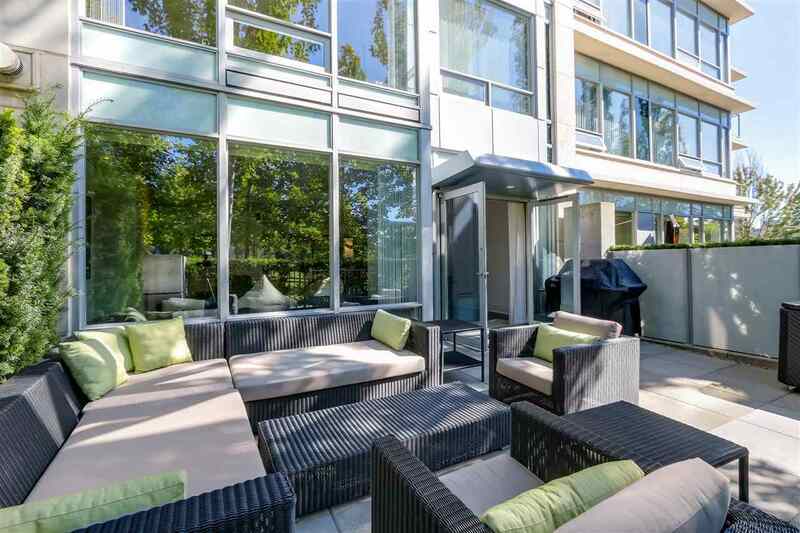 KINGS' LANDING VILLA: Striking 2 level, 3 Bedroom, 2,031 sf Villa on the water's edge with views over False Creek & the Park. Designer touches include dramatic 11' ceilings, crown moldings, marble finishes & more! Seamless cherry wood paneled kitchen serves up SubZero fridge, Viking gas range, Fisher-Paykel dishwasher plus granite counters & breakfast bar opening to a family room. Master showcases luxury ensuite with steam shower & heated floors. King-sized ensuite guest bedroom overlooks the charming park. This air-conditioned home is ideal for enjoying the afternoon sunshine & waterfront sights! Entertain on private 300+ sf West facing sunny patio! 5 Star Amenities, 24 hour concierge, storage locker, 2 parking stalls & private garage.